Living like I'm traveling, even when I'm not, allows me to find wonder everywhere I go, connect with people better, and change my overall perspective on life. Mary Collins, Founder. CEO. Chief Curator. I still remember my first solo trip abroad so vividly that it feels like I am still there. I was lucky enough to travel to Melbourne, Australia for a semester, in Spring 2006. I can clearly remember how scared I was at first, and how it was a huge culture shock- even going from the US to Australia, but it was also one of the most powerful, transformative experiences of my life. So much so, that I’ve spent the years since then travelling the world, and then creating my own travel company. One of the things that stands out the most is how I was amazed by everything. From the architecture, and the wildlife to the amazing food and culture, I literally walked around for weeks with my jaw dropped. I even have pictures of the most mundane things, like a wall of bamboo at the Melbourne Zoo, which at the time was fascinating. I felt like a sponge- open and absorbing every possible encounter and experience with wonder and delight. Of course, I didn’t want it to end, but what happened when I got home was equally unexpected. Suddenly, everything familiar looked different. My perspective had changed since I’d been away, and I was fascinated by everything I saw at home too. Without knowing it, being away turned me into a traveler in my own city. There is countless research out there, citing the benefits of taking vacations, including decreased stress, better sleep and even personal growth. “Vacations have the potential to break into the stress cycle. We emerge from a successful vacation feeling ready to take on the world again,” according to Susan Krauss Whitbourne Ph.D., author of Psychology Today’s The importance of vacations to our physical and mental health. So why not try to carry those benefits with you as long as you can? 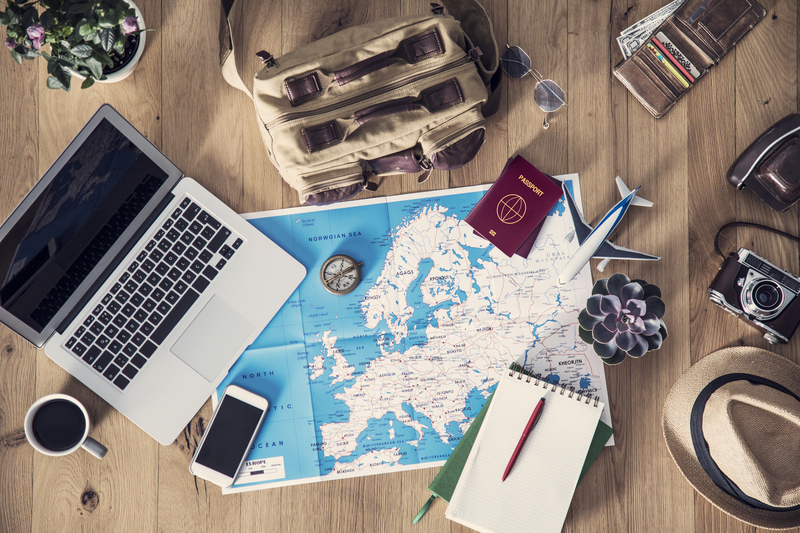 Here are a few ways you can live everyday like you’re travelling in 2019. Think back to the last time you took a trip- whether it was 2 months ago, or 2 years. What were the things you learned about? What were the experiences you sought out? If you went on a tour, did they tell you about who used to live there? Did you try new local cuisine or a popular local chef? Did you check out a popular hike or natural wonder? You can apply all of this in your own backyard. Getting to know more about your community’s cultural landscape, history or nature can be super rewarding. And the best part is, when you discover new things you love- you can go back again and again. Just because you live somewhere- doesn’t mean you can’t travel there too. One thing I have found over my years of travel is that any experience that includes more than one sense tends to stay lodged at the top of my memory. So why not apply that at home. When exploring a new restaurant or cuisine, take your time and really savor it. Being in travel mode at home doesn’t mean you have to limit yourself to history books and the back of the library- get out and indulge yourself. Would you buy the nice bottle of wine when you travel? Then, why not do that at home! Whenever I travel, I wake up and just love to take a walk around and see what I can see. On your weekends, or downtime, get out of the house, put your Netflix binge on pause and walk around. Being outdoors is great, and what’s even better- seek out a new area of town or a new hike to take in. The point is to see familiar things as new again, so seek out somewhere you haven’t been and take it in for the first time. Whenever I travel to a new country, I prefer to read up, watch documentaries and get to know the history of an area. It really helps you interpret what you’re seeing and enjoying, and generally enriches your time. Have you ever done that in your own city? Even if you think you know the history of an area, you’re bound to find something new. Take it one step further. Go down the rabbit hole- whatever you end up reading about, go visit it. If you read about a particular cuisine your town is known for- go try some or try to cook it at home. Cities are like people, they all have an identity, make it your mission to get to know yours, intimately. By doing all the suggestions above, you’ll inevitably get to know your local community in a new, exciting way. Continue that by connecting with locals who you learn about or who are involved in what your discovering. Follow them on social media, go to their events, and get involved. Making those community connections will enrich your life for years to come. It will keep things new, and exciting. And after all, that’s what living like you’re traveling is all about. Specializing in making the world a smaller place Mary connects people to community through stories, culture and of course, food. After traveling all over the world, Mary realized the beauty of connecting to the local community and the importance of giving back. Combining these passions, Mary creates unique experiences and tours for individual guests, parties and private events, inviting people to learn more about Washington DC, its neighborhoods and the local community, all while giving back through a one-for-one food tour program. Carpe DC Food Tours has been featured in Fox News, Brightest Young Things, Where Magazine, and USA Travel and has been rated a top tour experience in Washington DC for 4 years and counting. Carpe DC has also donated over 15,000+ meals to residents in need in the district. 5 Things That Made My Solo Travel A Success!